Ask fellow campers about "Smokemont Campground (NPS Campground)" and nearby attractions. Wonderful. The campground was primitive. Spots were wide open. Quiet, other than the wonderful Bradley Fork running 10 yards from our spot. No ATT or Verizon service whatsoever, but we enjoyed not having it. The majority of the campground was closed while we were on-site which we took advantage of by walking the dog through it. Absolutely beautiful. We would love to stay here again. We camped at Smokemont Campground (NPS Campground) in a Travel Trailer. Downtown Cherokee was 10 minutes down the road and came with full 4GLTE service. We stayed at local coffee shops during the morning to get full service and work done. Hiking was extremely quiet. Wildlife is present, so recommend traveling with some sort of protection ahead of time. We hiked up on a family of wild boars and had only our voices to protect us - prepare ahead of time. The hiking is beautiful. We wished they allow dogs on the trails to hike along with us. This is a lovely campground in a wooded setting with a shallow river running through it. There are no hookups and generators must be turned off by 8pm, so quiet campfires are a great nightly ritual. There are toilets but no showers. Sewage can be dumped and potable water refilled at the dump station on the way out. Firewood must be purchased on site on the horse stable side. There is no cell phone signal whatsoever. Not only is this campground remote, it's on NPS land and an Indian Reservation, which means absolutely no signal no matter which carrier you have. This campground is not big-rig friendly, I don't care what anyone else says. We have a 40' 5th wheel and I read the descriptions of every single available site before booking. I booked D28 because it was a long pull-through with no obstructions - wrong. The pull throughs are so curved that big rigs cannot fit. Also, there may not have been trees (obstructions) where the slides would have been, but there were trees too close to the pull-through entrance. The trees along with the NPS placed boulders prevent big rigs from being able to move around without causing damage. There was no way we were going to fit in D28 (or any other sites) whether we drove in or went around and backed in - it wasn't going to happen. With the help of the camp host and office personnel, we were able to secure site D42 instead. It was only available for half of our anticipated stay, so we had to leave after only 4 days. That site is the ONLY site in the entire campground that a big rig can fit in, trust me. The only reason is because across from it is a group camping parking lot that, if empty, can be used to position the RV and back into D42. Bottom line, find somewhere else to stay if you have a big rig. NPS needs to reevaluate their site descriptions and consider removing boulders, especially from curves and corners, which could cause serious damage to RVs. We won't stay here again. We camped at Smokemont Campground (NPS Campground) in a Fifth Wheel. Cherokee is wonderful! Islands Park is gorgeous. Friday/Saturday night bonfires with Cherokee storytelling was a highlight. Blue Ridge Parkway terminus is only a few miles away. Road across the Smoky Mountains is right outside the campground. One of the nicest NP campgrounds we have stayed in. 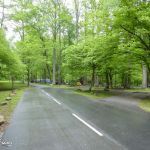 Fully-treed, level sites, no utilities at sites and no Verizon service accessible from the campground, distributed faucets and bathrooms with cold water only and flush toilets. There is a dump station. Park rangers make twice-daily drive-throughs. Firewood must be certified heat-treated in Great Smoky Mountain NP and is for sale at the stables (which offer horseback rides in the NP). Section F is RVs-only but we enjoyed site 32, at the end of D section, and had no neighbors. Good day-hike (and overnight backpacking) options from the trailhead next to this site. Generators 8am-8pm only. We camped at Smokemont Campground (NPS Campground) in a Fifth Wheel. Cherokee is touristy but has the closest usable Verizon cellular service (5-10 minutes from campground). There is a large Harrah'scasino and hotel comples in Cherokee now. The 30-minute drive to the Deep Creek area is worth it for waterfall viewing. Ditto Clingmans Dome for the mountain-top views. Slightly better than typical National Park. Paved roads and site pads. Scattered trees to provide shade but not privacy. No cell phone service. Standard NPS no electric, no wifi. Moderately full even mid-week in early April with thunderstorms raging. Back-ins a little tight with narrow loop road, trees on the sides, and near 90-degree angles. We camped at Smokemont Campground (NPS Campground) in a Motorhome. Qualla Java in town has excellent coffee and very good wifi. Near intersection of US 441 and US 19. There is also a Starbucks at the casino, but Qualla Java is better. As expected for an NPS site. No hookups and no showers, so about as rustic as it gets. $17 to camp in the off-season, though things were starting to get crowded on a weekday in late March when the weather was nice. Reservations are not accepted before May 15, and loops C, D and F were off-limits when we visited. If you camp during full occupancy, I would stay as far back in the campground as possible. The configuration means traffic for all 142 sites is funneled through loops A and B so I imagine it would be quite busy. Decent tree cover and you can hear the creek on the western side of the campground. NPS is a little stingy with campsite spacing though, so we had a pretty clear view of every person on the loop and what they were cooking. But nothing beats camping in the park and having trailheads at your campsite. We camped at Smokemont Campground (NPS Campground) in a Motorhome. Stayed here two nights in a motorhome. The spaces are wide and give plenty of room for privacy. There are no hookups and also no cell phone or Internet coverage. Also the generator hours are 8am till 8pm which makes it difficult for us coffee lovers. Otherwise it is a great park if you like to be off the beaten path to enjoy the seclusion and wildlife. Would probably stay here again but not over one night. We camped at Smokemont Campground (NPS Campground) in a Motorhome. We stayed in the A section in our 22 foot TT. Our slot was double wide which was great for our TT and the tow vehicle parked beside it. This is a wooded campground so solar would be an issue if you needed that. The A section is a "no generator" area so it was predominantly tents....which was great with us...don't like being beside big rigs. The spaces were the farthest apart we found in GSMNP. The bathouse was clean and centrally located and had a sink outside for washing dishes. There was also water easily available. The dump station and trash were convenient as well. The campground is directly on a beautiful creek and there are hiking trails leaving from the campground. Overall a terrific experience. If the spaces were even further apart it would get a 10. We camped at Smokemont Campground (NPS Campground) in a Travel Trailer. Site A6 Smokemont Campground Why we chose here? It's in the southern part of the Great Smoky Mountains Location: North Carolina, just north of Cherokee Peak Season: 15 May to 15 Oct Sites: 142, they say it accommodates 35-40' RV's but there are limited spots for these sizes, especially for 5th Wheels as we need to fit a truck on the site as well, unhooked. There are a number of loops, F loop which is for RV's was closed as it doesn't open until the 15th May. The campsites are tight. Facilities: Restrooms, Dump Station with drinking water, Garbage bins Groceries: Cherokee is 8 miles away, the Lion grocery store is next to McDonalds on the 441 Reservations: Yes, but not before 15 May Cell Coverage / WiFi: No, you will get it in Cherokee Price Paid: $17 off peak, $20 in peak season Date of visit: May 2016, we camped in A6 Other: There are some trails accessible from the campground. No generators are allowed in loops A, B & C during peak season. Quiet hours 10pm to 6am. Loop F is for RV's only. Loops D & F are closed in the off season. Ranger station in the campground. The campground runs along the river. Self registration during the off season. Ten minutes to the town of Cherokee Would we come here again? Yes, it's a nice campground. We camped at Smokemont Campground (NPS Campground) in a Fifth Wheel. The campground is close to the main road for traversing the park and easy distance to Cherokee for touristy stuff. We stayed in the F loop with a popup. The sound of the creek nearby was nice. Site F12 is private, but there was some poison ivy around the perimeter during early August. The campground does not have an onsite store other than wood and ice at the horse riding stables nearby. The men's room in the single F-loop bathroom facility was cleaned daily when we were there, but there is only one sink with an annoying push button control directly over the middle of the basin. We camped at Smokemont Campground (NPS Campground) in a Tent Trailer. We had a shady spot on the end with lots of space. Although it didn't have hookups, it was very quiet and the numerous restrooms were regularly cleaned. We saw the synchronous fireflies. It was a very peaceful, relaxing weekend. 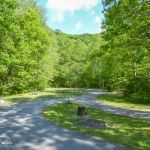 The only frustrating thing was that we couldn't hike with our dog on the park trails, which is a park policy, and why we don't go to the Smokies more often. We camped at Smokemont Campground (NPS Campground) in a Tent Trailer. Go in early June to see the synchronous fireflies! Stayed three days in the F loop at site 44, a great spot with the river running directly behind the site. We got to fall asleep to the sound of running water, which was wonderful. No hookups at any sites. Our Verizon MiFi had no signal, even with a cell booster, but we could get a signal (even without booster) once we left the park and went south into Cherokee. Some issues with barking dogs (which happens in every campground), but other than that noise wasn't a problem - this wasn't a partying crowd like a lot of campgrounds tend to be plagued by on the weekends (the lack of connections and the fact that F loop is an RV only loop probably helps). We camped at Smokemont Campground (NPS Campground) in a Motorhome. This is a great jumping off point for exploring the trails - Clingman's Dome is a must!! Getting Internet in the park is impossible unless you climb pretty high and end up in a spot with a clear view, then it's possible to get enough of a signal to do some basic things. Bad luck on our part. The weather was not cooperative at all. It rained so much we were expecting Noah to come sailing down the creek, which rose to an alarming level over one of the nights there. Beautiful cg. Just a little pricey for dry camping though kept it from a 10 in my rating system. Sites in F loop are large & reasonably spaced. CG roads had some tight spots for a large rig but doable for anything with care. We camped at Smokemont Campground (NPS Campground) in a Fifth Wheel. Another typical national park campground. Prior to May 15, only walk-in sites are available, however only in Loop B. The more desirable Loop F as well as all other loops are closed until May 15. Loop B contains small sites more suited to tents and small trailers. We were able to find a couple of sites that could accommodate our 30’ trailer but we had to park the truck in a separate spot. In many sites, the picnic table and sitting area is on the street-side of the trailer. No hookups are available. They do have flush toilets which are kept clean. There is a beautiful stream that flows through the campground and flows right by many Loop F sites. Roads and sites are paved. Sites are fairly level; we did not need to use side-to-side leveling blocks. The is a very faint Verizon signal although we could not get an improved signal using our booster and external antenna. Heavy tree cover prevents the use of satellite. We camped at Smokemont Campground (NPS Campground) in a Travel Trailer. Beautiful park, however definitely not big rig friendly. Yes, sites themselves are large enough, but travel on the campground roads to get to them (and in/out of them) is tough! There is also the issue of low-hanging branches throughout the campground that will brush your RV. Although a nice campground, we will not camp here again and recommend that if you have a >30' towable (FW/TT) or >34' MH, pass on this campground. 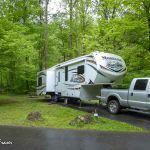 We camped at Smokemont Campground (NPS Campground) in a Fifth Wheel. National Park campground. Loop D are all pull through, loop F is all back in. Roads paved. You can get Wi-Fi and cell service down at the visitors center. Verizion data service works well down here. They have a dump station and water down there. Campground generator hours are 8-8. A nice quiet campground with lots of hiking. There are no showers and only 20 amp hookup available in the handicap sites. Plan on a boon docking dry camp experience. Old peoples pass is $10/night. Use recreation.gov for reservations. 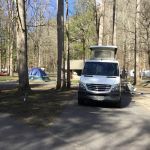 We camped at Smokemont Campground (NPS Campground) in a Motorhome. Are you affiliated with Smokemont Campground (NPS Campground) ?